The following websites have a large marketplace, and, no matter whether you're a developer, designer, marketer, virtual assistant, photographer, versed in furniture assembly, or involved in any other freelance business, you're likely to find something that interests you. The positions include freelance jobs from home, but also some on-location work. Clients post jobs, and if the job fits your profile, you get matched with the client and prompted to set a quote for your work. You can also offer your skills for a fixed price, and be picked by clients directly. Job categories include Design, Marketing, Social Media, Software Development, Translation, Web Development, Writing, and more. 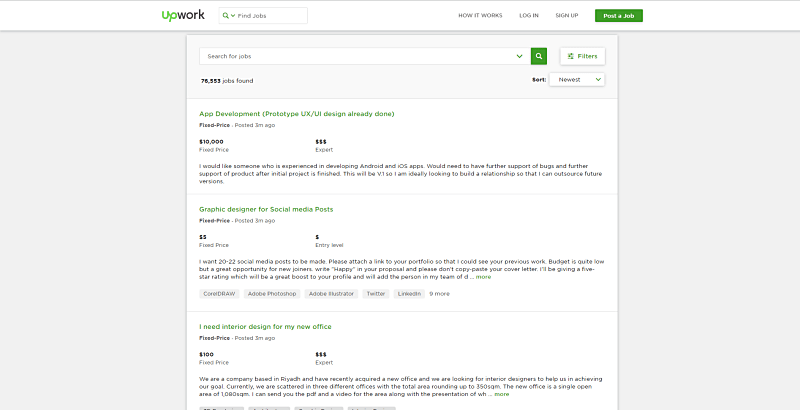 Upwork (formerly oDesk and Elance) has a large pool of clients, but also a large pool of competitive freelancers you need to outbid and outshine in order to get the job. You fill out your profile, set your hourly rate, and wait for clients to contact you. Or, you browse the job list, bid for jobs you like, and hopefully, get hired for them. The platform requires you pay a percentage of your earnings per project(<$500 - 20%, $500-1,00 (- 10%), >$10,00 (- 5%)), and the work pool includes web development, mobile development, writing, customer service, marketing, accounting, and anything else you can think of. The Muse offers a great Work-at-Home section where you can browse remote/flexible jobs or jobs tied to a particular location. You can browse the list of jobs by desired job level (Internship, Entry, Mid, Senior), desired company size (Small, Medium, Large), Job Keyword, Title, Career, and Location. Once you see a job posting you like, you can save it, read the job's detailed requirements and benefits, and apply directly. Jobs you can find are various and include admin, design, development, writer, customer support, accounting positions, among others. FlexJobs offers remote, part-time, and freelance jobs in over 50 categories - the jobs are hand-picked by the platform's researchers, so the work you find here is legit. Apart from an extensive job board, you can also take skills tests (for a subscription fee), and provide proof to potential clients of your expertise in a subject. Apart from the usual job categories (software development, graphic design, writing, tutoring, administration), you'll also find some rarer positions, such as Bilingual customer support (for example, jobs for Fukienese, Yiddish, Luganda, and Chuukese Interpreters) or Environmental & Green job positions (jobs such as Water Treatment Sales Consultant, Major Gifts Officer). Working Nomads is another free job platform where you can browse through a list of the most recent remote jobs - the jobs are tagged by category and type, and you can browse them by specific keywords, and skill sets. You can also set up job alerts for specific job categories to be sent directly to your email, either daily or weekly. Job categories available include development, management, system administration, design, sales, consulting, HR, education, health care and more. Solid gigs offer more than just a list of freelance jobs - you also get a chance to join their freelance community and learn from their freelance course library. Solid gigs actually combine the best jobs from other job boards - the website's team of freelancers goes over various job lists every day and gathers the best they can find. Then, you get an email with their picks every week. Within this platform, you'll also get interesting freelancing courses and tools covering topics such as sales, client acquisition, pitching, and more. The price for the platform's resources is $2 for the first trial month, and then $19 for every subsequent month. Remote offers you a great selection of remote jobs from all over the world - you'll get a chance to get hired by top companies such as Amazon, Carbon Black, and hotjar, but also other, smaller, but perspective businesses. You can go through Remote's list of jobs, grouped by role, type, and experience level - once you find what you like, you can see how many people have applied so far, and then apply yourself, through the “Easy Apply” button. Some clients also post the price they offer for the projects, but you can mostly make arrangements yourself, once you contact the client. As an alternative, you can disclose your job type and location to receive email updates directly to your inbox. Mostly covers development and designer jobs, but you can find other positions as well. Nexxt promises millions of jobs, hundreds of sites, and thousands of companies - and it seems to deliver on that promise. You can also enter your job title and other keywords, specify your location, and search for the corresponding jobs on the website's main page, or set up email notifications for types of jobs you're interested in. Skip the Drive is another job platform that covers a broad range of job categories - from Accounting and Consulting, across HR and Marketing, to Project management and Software development. You'll be able to search the job board through keywords, select a specific job category, or browse through a list of companies offering remote work. With Skip the Drive, you'll also get a chance to receive email notifications about new jobs matching your searches, and browse through informative resources about working from home. This platform also offers a direct link to another job platform, Jobs2Career, where you can find 70+ remote jobs more. 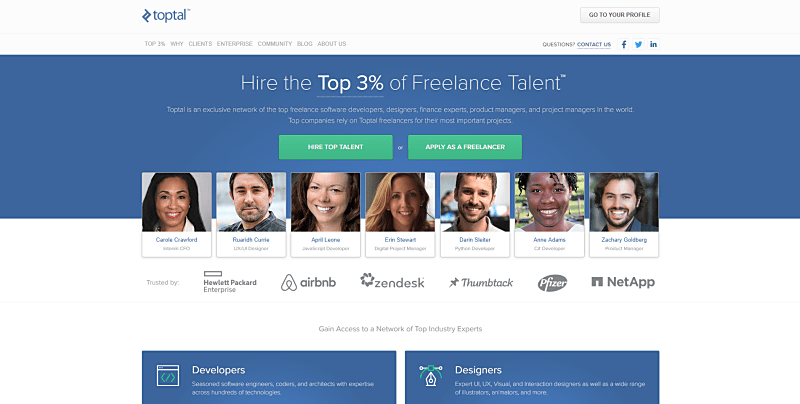 Toptal is a job platform that matches freelancers with start-ups, businesses, and organizations - the job categories covered are software development, graphic design, finances, project management, and product management. The platform is mainly geared towards clients looking for freelancers, and once you join their network of freelancers, you'll become visible to a number of prospective companies, such as Hewlett Packard, Airbnb, Zendesk, and more. Remotive offers an extensive selection of remote jobs where freelance professionals from the field of education, engineering, HR, marketing, sales, product, and customer support can find work. Once you enter a job description, you'll be able to apply to the selected position directly from the website, but also check the Social Media accounts of the company where you want to apply, and view a list of similar jobs. Authentic jobs offer a job board where you can find positions for developers, designers, writers, marketing specialists, and managers - within this website, you can filter the job pool by job types, your skills, location, job level, company type, and type of compensation. If you don't find what you're looking for, you can create a job alert for a specific keyword, or combination of keywords, and have all jobs matching this criterion be sent to your inbox, as soon as they appear. LinkedIn, being a social network for business professionals, is a great place to find freelance work - and not just through regular networking. LinkedIn Profinder helps freelance professionals find new leads and clients - you disclose your email address, define the service you're offering, and wait to be notified of clients who are searching for your service. Then, you'll be prompted to contact said clients and send them your proposal for the requested service (these clients will now also be able to access your full LinkedIn profile). LinkedIn Profinder is more of a facilitator than a regular job platform - once you make a connection with the client via LinkedIn inbox, you'll be able to exchange contact email, phone numbers, or whatever else you need to make arrangements about the project. AngelList is a job marketplace that connects you with startups - you create an account by providing your basic information, uploading a resume, importing your LinkedIn profile, and describing your current role and expertise. You'll also get a chance to define the type of employment you're looking for, select the size of your prospective company, and specify your desired salary. Later on, your profile will be added to a list of freelancers, where you'll have a chance to get noticed by clients and companies. You can find work on AngelList if you're an Engineer, Designer, Product Manager, Sales or Operations Specialist, or Marketer. You can also simply search the job listing by specific keywords, and filter jobs by the relevance they have to your entered keywords. 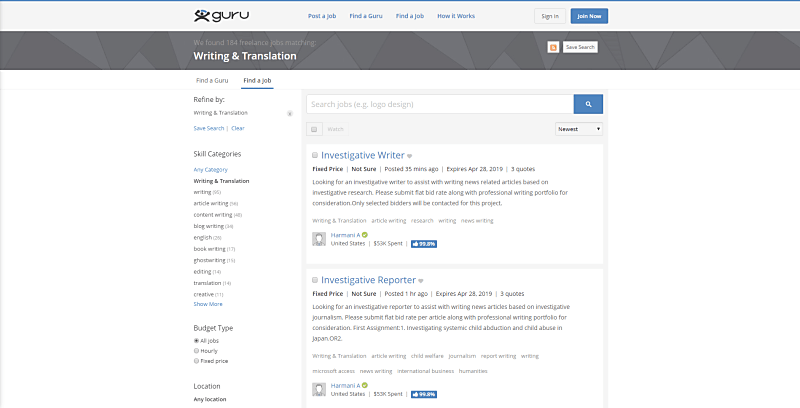 Guru offers you a job board where you can bid for jobs and send quotes to prospective clients - simply, enter your keywords, and determine whether you want to view the newest jobs, oldest, or those expiring soon. You can also filter by specific skill category (Programming & Development, Engineering & Architecture, Business & Finance...), Budget type (hourly rate or fixed price), and Location (specific city or country). You can also increase your chances of getting paid properly by selecting to view only jobs who offer a verified payment method. goLance is an international job platform that offers a large job base covering various job categories - you'll be able to search the job board by entering your keywords, or select a specific job category. To speed up the job search process, you can filter by specific parameters, such as payment type, experience level, job duration, and hours per week. Each job offering on goLance also includes the number of people who have applied for this position so far - so you'll know how many competitors you have at any time. CloudPeeps is not your typical job website - it's a freelancer platform for matching clients with professionals for projects and ongoing work, based on the client's requirements. Here, you can mostly find copywriting and marketing jobs. You, as the freelancer, create a profile and submit a portfolio, and if a client browsing the website's list of freelancers likes what you have to offer, you get contacted. Alternatively, you send proposals for projects you want to partake in, directly to the client. CloudPeeps is more strict than other job platforms in terms of who gets to connect with clients, but once your application is accepted, you'll get jobs easier, because of limited competition. 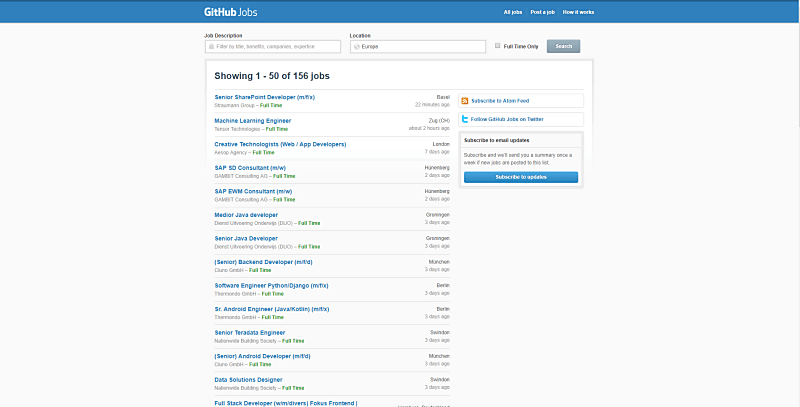 Genuine Jobs is a classic job board - you get to browse through a list of jobs (listed in order of date posted - the freshest jobs go on top), and then apply to those you like directly from the website. As per usual, you can search the job offerings by entering your keywords, or submit an email where they can send you freshest job posts that match your keyword searches. ProgrammerMeetDesigner is exactly what its name suggests - this website helps programmers and designers find other designers and programmers for partnership work on projects they've been hired to perform. But, the website is not limited only to programmers and designers - entrepreneurs and writers are also a separate category, so you can indicate whether you're a programmer, designer, entrepreneur, or writer and whether you're looking for a programmer, designer, entrepreneur, or writer to work with. You can also offer your services on the website's “Find a Job” community blog - write something about your skills and qualifications and provide links to your website or portfolio. ProgrammerMeetDesigner also offers a direct link to StudentFreelance.com, where students can find opportunities for freelance work. 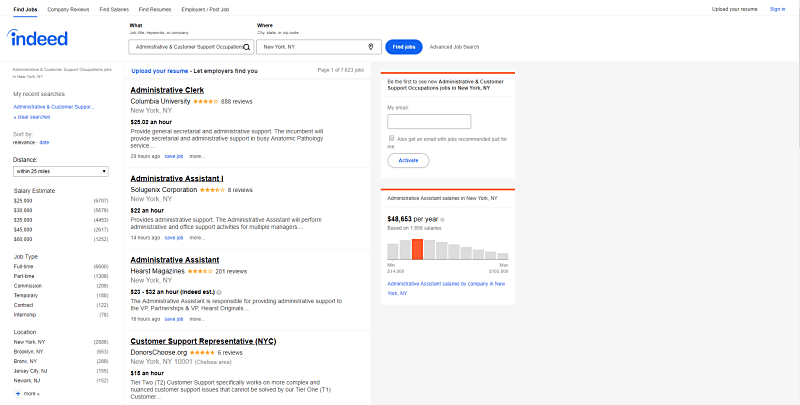 Monster lets you find jobs in the US, connect with employers, and make use of tailored career advice - once you create a free account, you'll get a chance to upload your resume and receive customized job alerts for positions you're looking for. You'll also be able to browse through job offerings and tips through three search engines - you can search for specific jobs, companies, and even career advice, without even creating an account. If the location of the job is an important factor for you, you can also search the job offerings by US state, city, or city district. Dice is an easy-to-navigate job platform, where you'll see all listed jobs posted on a board - simply select your desired title, location, company, employment type, and whether you want to be hired directly or via a recruiter. You'll find work from around the globe (though most work is remote anyway), and either apply immediately (you'll need an account for this) or create a job alert to be sent to you, each time a similar position appears. Indeed is one of the more popular websites for finding freelance jobs - here, you can browse through an extensive list of jobs by entering your desired job title, company, or skill you possess as a keyword, and specifying job location. You can then sort and filter your selection based on your desired salary, job type, company, and experience level - once again, you can also enter your email address and have jobs you're looking for sent to you directly. ZipRecruiter is a US-based job finding platform for mobile devices - you'll be able to easily apply to the jobs you like through your phone. 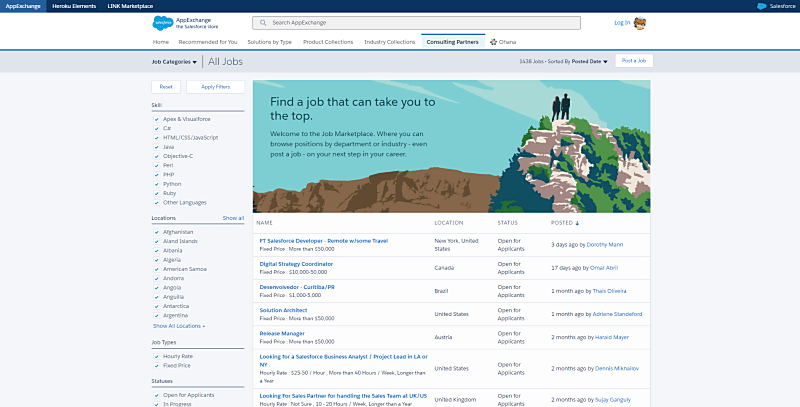 You'll also be able to browse through a classic job board - the various jobs are categorized by industry, job type, location (US state and city), and company. If you don't want to bother with selecting these parameters, you can simply enter your desired job title or other related keywords in the search menu. OnSite is an exclusive freelance platform that only accepts the best 5% among its applicants - if you're approved, you'll have a fair chance of finding quality work, considering your competition is scarce. You'll be able to submit your resume and fill out your profile in a way that shows your skills and qualifications best. Bear in mind that you'll need to have a personal website in order to apply for consideration. Krop is a job platform which offers work to professionals in creative fields - job categories include (but are not limited to) development, design, copywriting, and fashion. You can browse jobs by specific keywords and location, but you can also subscribe to email alerts and receive regular notifications for a specific job category. Sa Creatives is a job platform for freelancers in South Africa who are versed in a creative business, such as 3D and 2D animation, presentation design, digital marketing, content editing, interior design, etc. Each job has the usual details, including description, info about the company, key responsibilities, desired skills, and qualifications, as well as information about how to apply. Career Builder is another classic job board with all the classic job board elements - you can browse through a list of available jobs, speed up your search by entering keywords or location, and refine your search by selecting the right parameters. By default, most recent job posts are on top of the list, and you'll be able to save jobs you like or email them. Each job has an indication whether you can apply directly from the website (“CareerBuilder apply”), or you need to go to the company's website to do so. You can also upload your resume in order to have job opportunities matching your qualifications and experience appear as a separate list. Clients create profile pages for jobs with the job description and budget - you'll also be able to view how many people applied so far when the job expires, and if you're interested, you can click the “I'm interested” button. SimplyHired is the ultimate job board - you'll find all possible freelance work here (from game testing to train pushing), in nearly 2,000,000 vacant positions. To make matters simple, SimplyHired is as straightforward as job boards get - select your desired job type, minimum salary, sort by date or relevance, and then make your pick. You'll view the description of each job, necessary education and skills, as well as benefits provided and the budgeted hourly rate - then, if what you see suits you, you can click “Apply”. Freelance Directory is a freelancer marketplace, where you can create an account to join (4 months minimum for £20 + VAT) - you can only apply if you're UK-based, and most of the available jobs are in the creative and media field. You'll need to disclose your skills, location, and experience, create a full profile with portfolio, in order to become visible to a number of clients browsing the website. Freelancer is another popular freelancer platform with a bidding system where you can browse an extensive job board - you'll find very specific job opportunities here, such as shoe design and pharmaceutical writing, but also much more. All jobs show how many people have placed their bids so far (and what the average bid amount is) - once you select a job, you'll see an extensive job description and a place to enter your bid. You'll also get a chance to participate in reward contests (over 1,200 of them), and enter a list of select top jobs (if you sign up for an account). ServiceScape offers job opportunities to editors, translators, graphic designers, and writers - you sign in, create a profile, and you're added to the freelance directory, where clients will be able to see you. Here, you can also attract clients by setting up projects you think they'll like (either in the form of a free sample, or a paid project) - to facilitate communication between you and the clients, you can use the built-in communication system that allows you to send and receive messages, as well as schedule conference calls. To apply, you'll need to fill out a form, provide your credentials and define your expertise - the more you say about yourself, the more likely you are to get contacted by clients. Workhire is a bidding-based job platform aimed at freelancers in India - you get to choose a category (Web Design, Accounting, Medical Writing, Legal, HR jobs...), and then browse the corresponding job board. The usual search options are available, and each job has a budget already listed - you can place proposals in the form of comments below at the bottom of the job's page, and wait to get contacted by the client. Cult Jobs is a job platform for freelancers in Singapore - here, you'll find great Singapore-based job opportunities if you're in the advertising, media, design, or marketing business. You can search by company, job type, job category, but also enter your email to receive direct job alerts for your keywords. Craigslists often gets a bad reputation, but you can find some great US-based job opportunities if you look into it . You can apply for the positions of legal assistants, attorneys, cooks, sales representatives, and pretty much anything you can think off - but, bear in mind that the website doesn't hold the client accountable for payments, so do your research on the client before taking on a job. The forum Reddit, being the meeting point of many professionals, is also a great opportunity for you to land a freelance job - specifically, you can check out the /r/ForHire page, and offer your services (posts labeled as “for Hire”) or look for jobs (posts labeled as “Hiring”). There are other rules to this Reddit page you need to check out as a freelance before posting, and bear in mind that this board mostly works in your favor - the clients cannot ask for free work (no “work for exposure” jobs), they have to disclose their budget (which cannot be lower than $10/hr), and must be informative about the work they're offering. This Reddit page is for individual freelancers, and if you're a team of freelancers or agency, check out . If you're just starting out in a freelance business, you'll need some websites that offer entry -level positions and are more lenient when accepting new members - here are some of the best freelance jobs online for beginners, and best freelance websites for beginners, students, and recent graduates. FreelanceMyWay offers a bidding-based job board where you can find job categories such as web development, mobile phone development, designing, writing, data entry, admin, SEO, and marketing jobs. For each job, you'll see the number of people who made bids, as well as the client's budget for the project - once you select a job, you'll also view the specific freelancers who have made their bids. Then, you can submit your own proposal. XPlace is a subscription-based job marketplace where you can find work in 675 categories (from TV & Theatre Work to Engineering). Once you set up an account and create a profile, you'll be added to access a list of freelancers, categorized by job category. The number of projects is smaller than the number of freelancers per category, so make sure you tag your profile with effective skills and knowledge, in order to stand out. Damongo is a marketplace where you can find micro jobs - you can either post your offer or browse through a list of clients who are looking for someone to work on their projects. While browsing through (buyer requests), you'll see the expected time of delivery and client's budget - when you find something that suits your skills and needs, you can send an offer. When it comes to posting offers, Damongo is similar to Fiverr - you explain your skill and set your price (usually anything from $5 to $20), and wait for the clients to come to you. Hirable is another job platform with a simple job board listing mostly entry-level positions - you'll be able to refine your search by selecting your desired position (anything from assistant manager to driver). Each job has a short description within the website, and once you select a job, you're taken to the company/agency/client website, where you can read more information and apply. WeWorkRemotely is perfect for any newbie freelancer who wants to work remotely - you'll find business & management, customer support, programming, design, and copywriting jobs, among others. You'll get full information for all companies who post jobs here - the price to merely post jobs is $299, so you can expect serious and reliable clients. 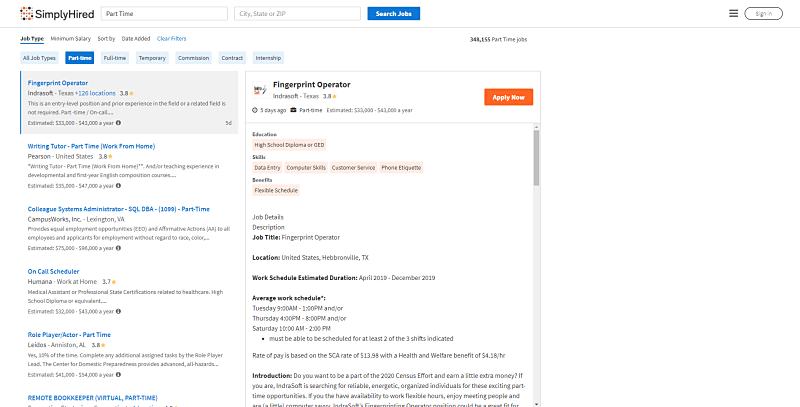 Truelancer is yet another bidding-based job platform, but it's one of the more popular ones, so it's always worth checking out. You'll find interesting projects if you're a developer, designer, blogger, writer, SEP specialist, or versed in sales & marketing. 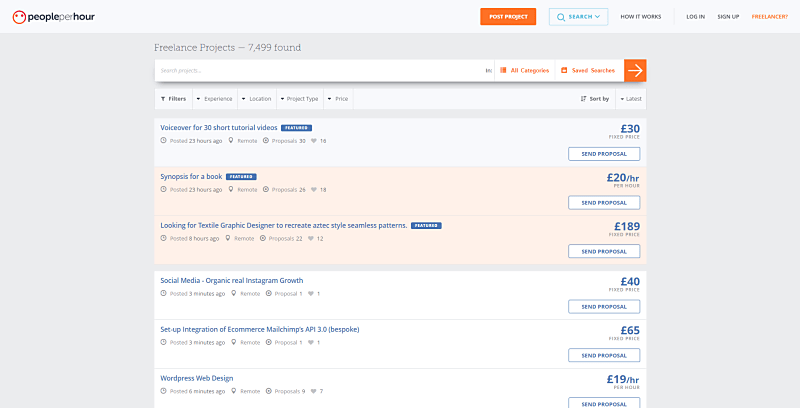 You'll be able to sort projects by Latest, Popular, Featured, and those Expiring soon, and you'll get a nice overview of the number of proposals-per-project just by glancing at the job boards. However, to make your own bid, you'll need to sign up for a free account. Freelanced is a Freelance Social Network, where you can connect with clients and other freelancers. You can find work by uploading your portfolio for clients to view (your rates aren't publicly available, but the client can ask for them). You can also find work by browsing through a job board (again, the budget isn't publicly available, and you'll have to ask the client for it). You'll get to see the number of applicants per job, and apply directly through the website (you'll, however, have to open an account first). College Recruiter is great for students and recent-graduates looking to easy into the professional job market - you'll get some great resources for newbies, such as job search advice and a resume builder. To find a particular position, simply enter your keywords, desired location, job category, company, and employment type. What's unique here is that you'll also be able to define you commute to work (by indicating whether you want your work to be within walking or driving distance from your location, by indicating how long a commute you want...). Jobs include anything from development to gardening, and you can apply via Social Media, or by applying directly through the website. Fiverr is also one of the more popular entries on this list, and if you've ever read anything about freelancing websites you'll know the gist - you define your service, select the amount you want people to pay you for that service (typically $5, but you can ask for much more), and wait for clients to contact you. As long as the service you're selling is legal and in compliance with Fiverr's terms, you're free to be creative - for every transaction you make, you get t (keep 80%) of the full price. Broxer provides you with a job board listing both remote and on-location work - here, you can search for SEO, Content Writer, Design, Video Creation, Translation, and Sound Design work, among other opportunities. To apply to positions you want, you'll need to submit your details to the company's email address, listed under the “Apply for job” button on the Broxer website. 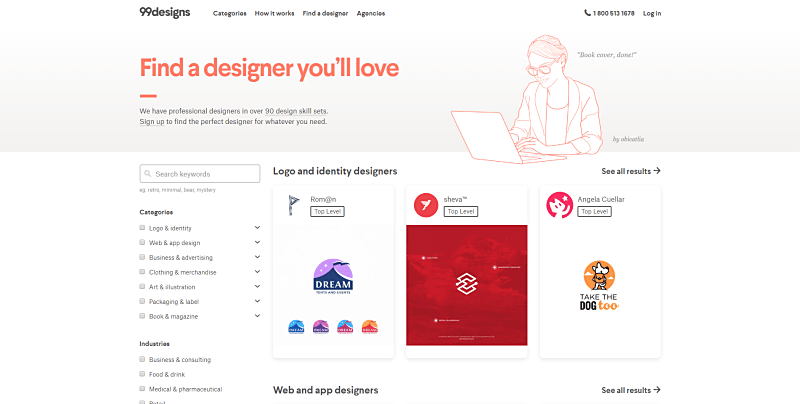 You'll really have plenty of options to find freelance work for developers - bear in mind that most websites that offer work for designers also offer work for developers, so make sure to check out the “freelance websites for designers and artists” section of this list as well. 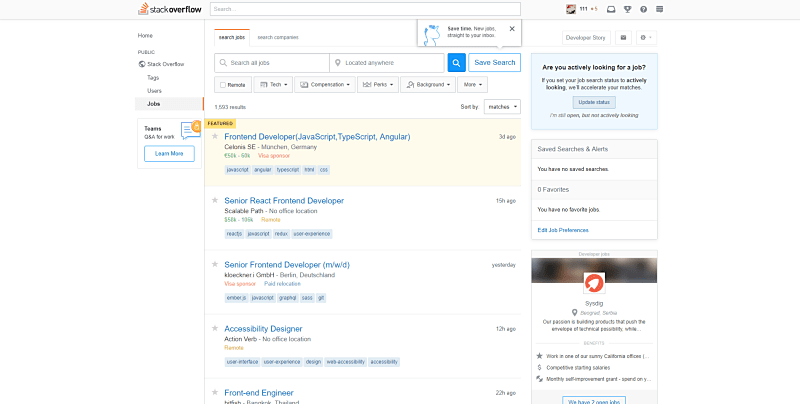 Stack Overflow provides an easy-to-browse job board with various developer jobs, from data engineering to C# Senior Developers. As is the case with most job boards, you'll simply need to enter your desired keywords - apart from the usual parameters, you'll also be able to filter by perks you want on the job (suchs as 10+ vacation days), define the tech you like (and dislike), as well as look only for jobs where they are few applicants. You'll also be able to filter by compensation in a compelling way - you can enter your desired salary with your country's currency, and the search engine will show you only the positions which match your desired salary when converted to your currency. If you create an account, you can also write up your Developer Story and get job matches more suitable to your specific skills and experience. Scalable Path is a network for matching remote developers and clients all over the world - you'll find work if you're a frontend or backend developer, but there's also work for other digital professionals (graphics designers, copywriters, project managers, to name a few). You'll need to open an account and fill your profile in detail - then, you'll get invited to apply to projects that suit your skills, go through an interview and work directly with clients who hire you. You're probably more than a little familiar with GitHub, but did you know that there's a GitHub job board? Here, you'll find various job opportunities from around the world in the field of development, and be able to filter by job description, benefits provided, companies, expertise, and location - to get all the newest postings that suit your interest directly to your email, you can also subscribe to weekly job alerts. Each job has a specific manner of application, but you usually need to send your resume via email or fill out a simple application form. 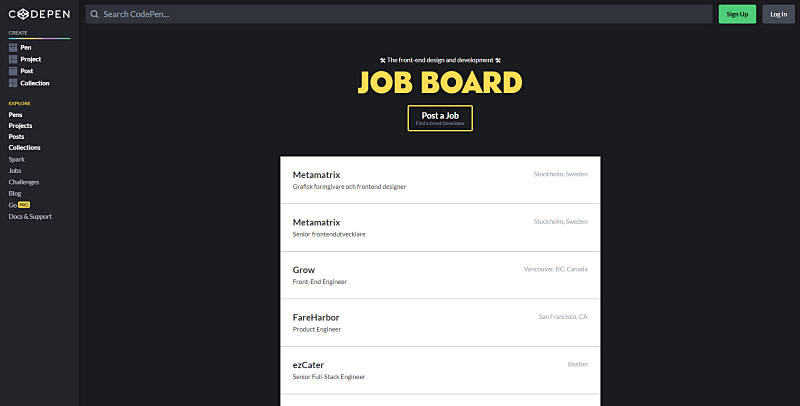 CodePen is a social development environment aimed at front-end developers and designers that features a comprehensive job board - work provided includes both remote and location-based jobs. You'll also get the chance to join teams and work on projects with them. 10X Management is an exclusive platform for matching developers with clients that only accepts a small percentage of applicants - but, once you're in, you'll get a chance to work with high-end and innovative projects. This platform is currently looking for professionals versed in full-stack engineering, data science, DevOps, and similar skills. Sologig is a job platform with a job board that offers IT and engineering jobs grouped by US state and city. Once you pick a city/job title, you'll be taken to the job board where you can browse the offerings, refine your search with the right parameters (e.g. you can filter by offered salary) - to apply to a position, you'll need to provide your email address. Joomlancers is yet another job platform that offers a job board with the latest opportunities in the field of development - you'll get to pick projects based on their disclosed budget and make your own bids. You can view the number of people who made bids thus far and view the project specs, as well as the time you have left for bidding. Search Volume:2,800/mo • Total Visits: 82.50K • Number of available positions: ? Gun.io is a freelance-oriented work platform designed to connect various types of software developers (QA, DevOps, Scrum Masters...) with software companies. This platform is more strict when accepting new clients than when accepting new freelancers - the website promises they only accept projects with interesting development challenges, so you're likely to come across exciting projects if you create an account here. PowerToFly is a developer community where women developers help, elevate, and support each other - and there's also a job board. Here, it's the companies that create profiles to attract perspective freelancers, and you can really make your pick among high-quality companies - apart from that, you can browse for specific job titles, and locations (or indicate “remote” to look for remote opportunities). Rent-a-coder gives clients an opportunity to “rent” a coding specialist - and that could be you. The clients post jobs, and you can scroll to look for something that suits you - each job post shows a location, yearly salary, and when the job was posted. There are opportunities listed for AI engineers, IT product leads, full stack developers, and more. Codeable is a freelance platform for Wordpress developers - if you're skilled in WordPress, it's worth checking out. This is another exclusive community so only about 2% of all applicants get in - but if you're among the 2%, you'll have steady work, and a chance to connect with other digital professionals, such as marketers, designers, and other developers. The platform also turns down clients who don't meet the requirements, so you'll be working for quality people, on challenging projects, and for a premium price. WPHired is another job platform for WordPress professionals, only with a straightforward job board. 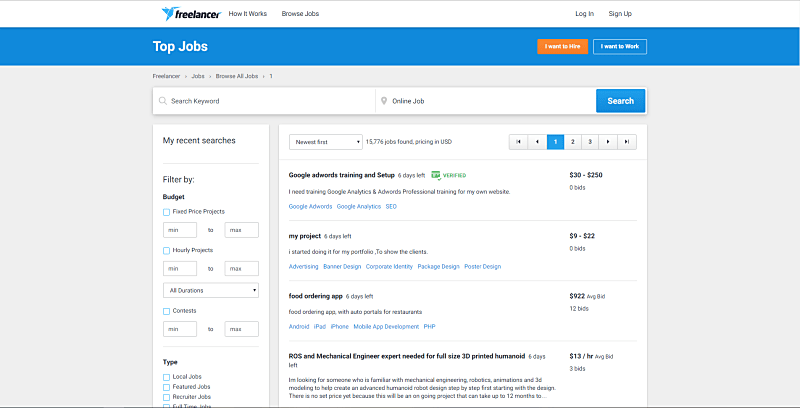 If you're a freelance marketer, chances are you won't have trouble finding challenging jobs at Upwork, Freelancer, Guru, or similar websites, but there are also some great freelance platforms just for marketers that are worth checking out. Before you apply to anything, you'll need to create an account - then, you'll be able to track the status of your application from one place, and once you're selected for a position, an agent will contact you. 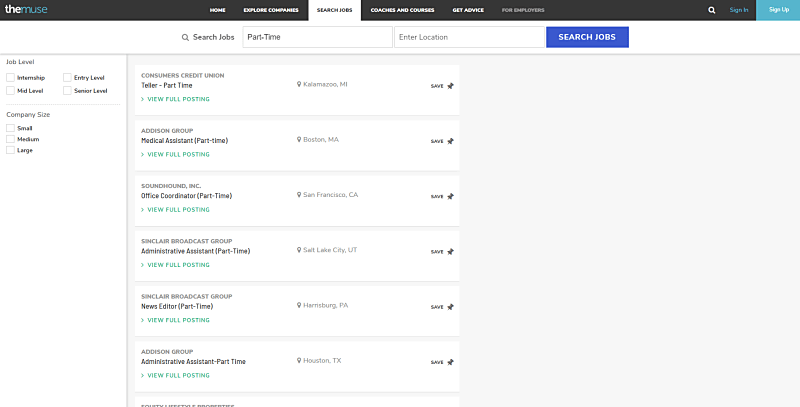 GrowthHub offers an easy-to-navigate job board aimed at Marketers, SEO Specialists, and Community Managers, among other digital professionals - simply search by desired keyword, job category, and location. Most of the jobs are US-based, but some also offer the option to work remotely. GrowthHub is a mediator website - it groups all marketing-related positions from various other job boards, and you'll be taken to the original job board when you click to apply. It doesn't matter whether you're specialized in logo design, creating new, exciting fonts, or in any other way artistically inclined - you're sure to find a freelance website just for you. Smashing Magazine offers a small but reliable list of jobs not just to designers, but also to programmers. 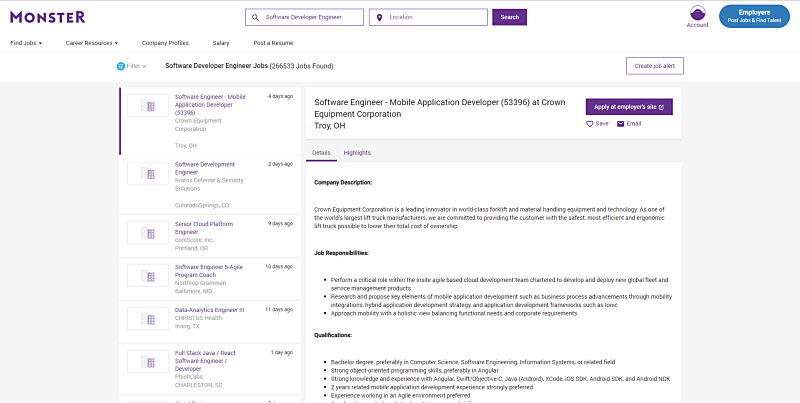 You can hunt for jobs directly in the search box, or filter by various parameters - location (whether the job is remote or not), job type (full-time or part-time), and job category (programming or design). Once you find what you like, you can apply directly from the website. 99designs is a designer community where you can find work in two ways - either by competing in designer contests or by working directly with clients (who'll contact you for projects if they like your portfolio). When looking for work, you can choose your desired industry, style, and design category - as time goes on, you start getting client and project suggestions based on your previous work. You'll also need to pay a certain fee for the website's service of matching you with clients - each time you start working with a new client you get to pay an introduction fee, which usually range (between 30%) and 50%, depending on the amount you earn. Before fully applying to 99designs, you'll need to pass reviews that determine your design level (which will also influence the percentage you need to pay for the new client introduction fees). DesignHill is a job platform for design work that facilitates design contests - the client posts a brief with the design description, graphic designers send him/her their solutions, and then the client makes a choice. Here, you can find a variety of design work - from brand identity and logo design, across package, clothing and menu design, to email and infographic design. You can also submit design work for a number of industries, from accounting & finance to youtube designs. Apart from participating in contests, you can also sell your already made logos and design work. DesignCrowd is a job platform for designers that offers a number of graphic design contests, both open and private, you can participate in - you can access open contests with no limitations, but you'll have to create an account to access private contests. Each contest has specs you can view before even clicking on its link - the number of designers who applied to the contest, number of designs needed, the amount you'll get if your solutions are selected, and the number of days left before the contests close. Once you select a contest you're interested in, you'll get a full description for the requested design, and you'll be able to submit your solution, or browse through a short list of similar contests/jobs you can also apply to. 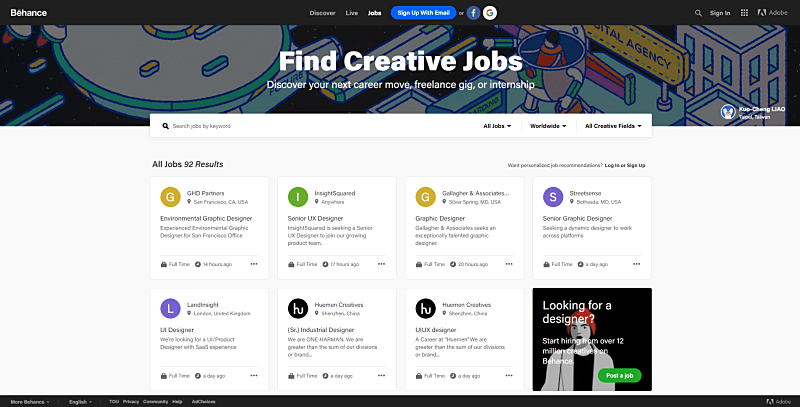 Behance is a creative community where you can showcase your portfolio and get noticed by clients - it's also a job board where you can browse through jobs by entering specific keywords, job type, location, and creative field. Once you select a specific job, you'll get a full description of the project, the required skills, and responsibilities, as well as an indication what formal education you need to possess to apply - once you're sure you fit the requirements, you can click to apply. Art Wanted is a free artist portfolio website where freelance artists can promote their work and services by uploading their art to the website's gallery. Here, you'll get a chance to sell your original artwork, prints, or digital files - and you pay no commission fee to the Art Wanted website for the work you sell. You can create your bio, fill out your profile, receive feedback in the form of comments, upload a video showcasing your art, and install a PayPal button to have your art easily sold and paid for online. SquadHelp is essentially a contest platform where people compete for the best brand name, but you can also find traditional design jobs, if you dig deeper. Most contests provide money rewards to the winners, and you can filter contests by industry, category (there's a separate Logo & Design category), status, award type (guaranteed or not guaranteed), and award amount. While browsing the list of contests, you'll notice that each contest has a visible number of days left, number of people who applied thus far, and the amount you'll get as a winner, if the award is “guaranteed”. Envato Studio is a community of developers, designers, and creatives where you can take part in various design projects in the categories of Video & Animation, Design & Graphics, as well as Logo Design & Branding. This is another more exclusive freelance websites, so you'll have to pass a screening process to officially join - once you pick your category, you can fill out an appropriate Registration of Interest form, and if the Envato Studio team likes your work, you'll get contacted. Then, you'll get to create a profile, name your price, upload some sample work, and define your turnaround time for orders - when you complete and are paid for a job, you get t (pay 30%) of your published price as a service fee to the website. 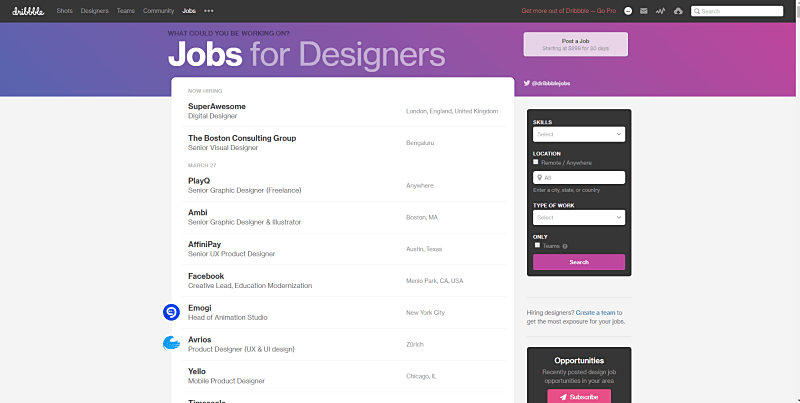 Dribble is an online community for designers with a classic job board - you get a list of jobs where you can apply directly from the website. Here, you'll find some high quality and high profile work from the world's top companies, such as Comcast, Twitch, 3M, CBR, Instasize, Centro, Bumble, Buffer, Tinder, Zendesk, Klarna, and more. Apart from the chance to browse through the job board, you'll also get a chance to create a profile for your freelance business and fill it with sample work, for prospective clients to see, like, or comment on. YunoJuno is an exclusive designer community for freelancers looking to find work in London - most freelancers from the community are based in London or New York, but you can also apply if you don't live in these cities. Upon sign-up, you'll fill out a form, and select your work discipline - “Photography”, “UX”, “Film & Motion”, and “Designer” are some of the designer disciplines available, but you can also select “Journalism”, “Developer”, or “Marketing”, so there's work for other professional freelancers here as well. Then, you can create a profile with your bio, provide a link to your portfolio, define your day rate, and explain your skills and qualifications - if your profile is approved, you'll start getting project briefs from interested clients. All clients are screened for their HSBC credit before they can hire a freelancer, and you receive all your payments for finished work from YunoJuno, and not the clients - you get paid on time, and don't have to pay a specific fee to the website, as that's taken away from the client's fee. Folyo is a private design community that connects designers with agencies and startups looking for design work - it's difficult to get in, and the website's owner (who's also a designer) screens all applicants personally, but once you're in, you'll get a decent chance to expand your client pool. When a client posts a job, all freelancer members are screened to find th (top 5%) who fit the job's requirements and budget best - if you're among the 5%, you can express your interest to work on said project, and if the client likes your work, you get hired. Coroflot is a classic job platform for freelance designers where you can browse through a list of various designer jobs. You can search the board by entering specific keywords or companies, by specifying the desired job location and choosing your job level. You can also search the job list by popular keywords already listed at the beginning of the list, apply to jobs directly from the website, and read more about your prospective employers. 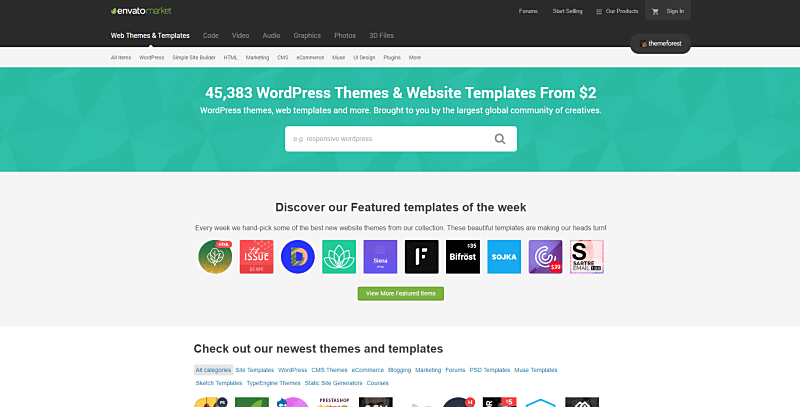 Graphicriver is an online community which is a part of the Envato market, where you can sell your logos, icons, presentation templates, fonts, prints, customizable design kits, and similar design work. You can apply to become an Envato Artist through your Envato account, and if you pass the screening process, you'll get to create profile pages for all your pieces, fill it with pricing information, and examples of your creative process, or infographics detailing your services. Awesome Web is a small, freelancer marketplace where you can submit your portfolio for approval and gain access to exclusive freelance jobs - once again, you'll have smaller competition, and greater chances of landing a job. When creating an account (you'll be asked to provide your billing details upfront), you'll get to choose between a monthly ($27) or annual subscription ($20) - once you're in, you fill out your profile with basic information, availability times, hourly rates, skills, and add three projects to your portfolio. After that, clients on the websites who like your work and specs will have the chance to contact you for work on their projects. If You Could Jobs is another selection of designer jobs - you get all jobs in a list, and you make your pick, depending on your desired company, location, project budget, type of contract, and end application date. At the bottom of each job description, you'll have a quick explanation about how to apply to the position. The It's Nice That section of If You Could Jobs offers a selection of freelance designer jobs grouped by company - you'll get a weekly rundown of available positions in companies such as Animade, Pentagram, Adobe UK, but also BBC Creative and the National Gallery. DesigBro is also a contest-based platform where you can submit your designs as response to client briefs - but the competition system seems to be more elaborate. Here, you can sell your work in the category of packaging, logo, brand identity - once you create an account, you'll be able to bid for projects. First, you'll get to reserve a spot on a project you like, upload your design, and wait for feedback - no more than 10 designers can apply to one job, and the client provides feedback and selects 3 finalists. One of the 3 finalists wins and receives the premium award, but the other two finalists also get a money award. CrowdSpring is predominantly a client-centric designer website where freelance professionals work on business cards, logos, package graphics, packaging design, email templates, and blog themes, among other design work. Search Volume:5,400/mo • Total Visits: 1.14M • Number of available jobs -? BrandCrowd is an easy-to-use online marketplace for designers, where you can advertise and sell your logo designs - you complete a 3-step process, enter your basic info, and then upload your designs. Clients can then browse through your work and make their picks - you determine your price, and the payment method you want to use (PayPal, Bank Check, Bank Wire...). You display your designs for free, and for every sale you make, you pa (a 40%) service fee to the website . Working Not Working is a free job platform where creatives can search for new clients and projects - you'll find designer, photography, production, animation, and other artistic work for top companies such as Apple, Facebook, Google, and publications such as the New York Times. This is another exclusive job platform where only a small number of applicants gets accepted, but you'll gain access to a perspective pool of clients and location-based job boards. MyFonts is an online marketplace aimed especially at font creators - you can sell and advertise your custom-made fonts. First, you'll need to submit your font for review - if your font is deemed as original and quality work, you'll receive a contract to sign (for each font you sell, you pa (a 50%) service fee to the website). Once you sign a contract, you'll need to send in the final font files, artwork showcasing your font, your designer bio, and define the price for the font. Actors, producers, and scriptwriters make a living by creating, managing, and bringing imaginary stories into existence - but that doesn't mean websites where they can find work are imaginary as well. So, here a select list of profitable websites where you can find work in the media production industry. Assemble.tv is an invite-only creative network for professionals included in video production - producers, creative directors, visual artists and post-production professionals. To request an invite, you'll need to provide basic information, your current occupation, portfolio pieces, and videos (if applicable). If you receive access, you'll get a chance to provide quotes to client projects - if your price matches their budget, you'll get hired on product launches, brand videos, and commercials, both live action and animated. ProductionHUB is a versatile job platform for Media production - you'll be able to view crew and vendor leads, create a profile that showcases your talent (paid feature), and browse through a comprehensive job board. No matter whether you're browsing through crew & vendor leads or film & production jobs, you'll be able to define the production fields you're an expert in, and decide on the preferred location of your next job - you'll also be able to view a selection of the jobs most recently added. If you decide to make a profile, you'll also get access to communicate with clients directly, and showcase your portfolio. Mandy is a community for actors, professionals in the TV, film, and theatre business, as well as extras, dancers, musicians, and similar professionals. You can join for free - to create an account, you'll need to define your profile type, location, and provide basic information before you can gain access to relevant auditions. You'll be competing with a large number of similar professionals, so make sure you make your portfolio stand out. You can scroll the website just like any other job board, and define search parameters to find what interests you - location, positions you're looking for, and time they were posted on the website. Efficient customer support is important for any company looking to have well-informed and satisfied customers and clients - so, here's where you can look for work if you want to work on improving customer experience. Support Driven is a typical job board, but geared at customer support specialists - here, you'll find work at companies such as Help Scout, Freshdesk, HubSpot, Zapier, Figma, and similar. Considering this is a typical job board, you'll be able to search the job offerings by entering your keywords, specifying the desired location of the job, or tick the desired parameters you want your job to match (Community, Freelance, Internship, Part-Time, Temporary...). Well versed in sales etiquette? Check out these freelance websites aimed especially at sales professionals. Commission Crowd is a sales network with a job board offering freelance, commission-only jobs in the sales industry - you can browse the board to look for opportunities, and you pay no service fee to the website for the jobs you get hired to do. There are no search options, so you'll have to scroll the list to find what you're looking for - each job has a description, location (territory), agent type they're looking for, as well as the commission percentage. You'll have to register for a free account in order to apply to jobs. Bidvine is a versatile sales network where you can offer all kinds of services to customers in the UK - everything from photography lessons to furniture assembly (IKEA furniture assembly is its separate category). You'll have to sign up for a free account to view the listings, but once you select your position (e.g. Wedding Planner) and the location (City of London), you'll get the exact number of jobs available (currently 26), before even signing up for an account. SalesForce Jobs is a job marketplace at the Sales Force store where you can browse through job positions currently available to various freelance professionals. You can specify your skill set (programming language you know), desired job location (anything from Afghanistan to Zimbabwe), job type (hourly rate or fixed price), and job status (open for applicants, in progress, cancelled). You'll also be able to view when each job was posted, and upon selecting a job, you'll get information on the required skills, expected start time, qualifications needed, and more. FreeeUp is a job marketplace for professionals in the eCommerce and Digital marketing business sphere - you'll have to apply to enter, and the website states tha (only 1%) of all applicants get in. Again, you'll have smaller chances of gaining access, but you'll have scarce competition for available jobs if you get approved. To apply, you'll need to fill out a form, upload your resume and portfolio, as well as talk about your previous projects, skill set, desired hourly rate, and provide other answers to typical job interview questions. Apart from that, you'll have to go through a real-time interview, pass some tests, and when you gain access, you'll get to browse through requested projects. Skilled with words but unsure how to make a profit out of it? Whether you're a copywriter, journalist, or talented in creating alluring fiction, here are some great websites and writing platforms where you can find inspiring writing gigs. Scripted is a freelance writing platform where you'll gain access to a pool of clients, if you pass the necessary tests. Once you're in, you'll need to fill out your profile, upload some writing samples that showcase your skills, and then wait for interested clients to contact you, or take a more dynamic approach to finding work. You'll be able to pick subjects from a list of requested topics, or pitch topics directly to clients. BloggingPro has a job board where you can find interesting writing assignments, mostly remote. For easier search, you can enter keywords, location, and other usual parameters, as well as define your desired job category (Blogging, Content Writing, Journalism, Magazine work, Technical Writing...). Once you select a job, you can visit the company's website or apply to it directly from BloggingPro. 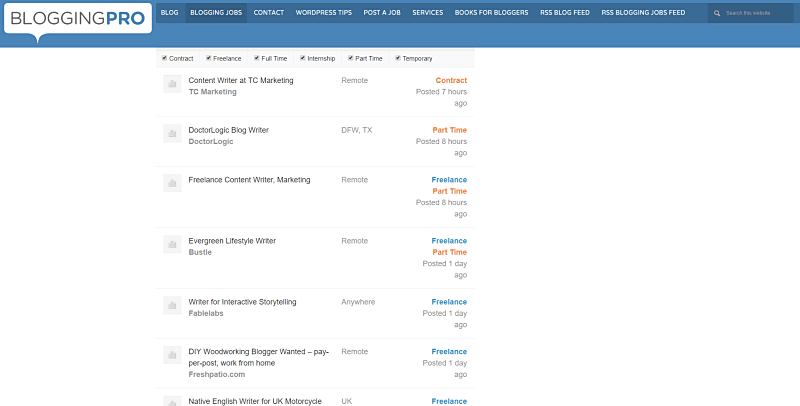 Contently is a freelance writing community where you can showcase your portfolio to potential clients, but also browse through a job board with some high quality writing gigs. Once again, you'll need to pass a screening process to gain access to job opportunities, but once you're in, you'll get a chance to work on various topics in various niches. Apart from writers, Contently also provides work opportunities to other content creators, such as photographers, designers, videographers, and illustrators. Freelance Writing is the ultimate freelance writing platform founded in 1997 with the largest number of writing gigs, combined from other freelance marketplaces, such as Indeed, Craigslist, and FreelanceWritingJobs. You'll get a chance to work for top companies such as Facebook, NBCUniversal, Adobe, Netflix, Bustle, Benefit Cosmetics, and more. Apart from applying to job positions directly from a job board, you'll also get a chance to partake in writing contests which all mostly offer money awards for winners and finalists (though you'll have to pay an entrance fee to partake in some). You can also subscribe to a Morning Coffee Newsletter, and receive updates on new jobs every morning in your email inbox. ProBlogger Job Board is also a typical job board - you browse through a list of available job positions, and streamline your search through keywords, and a limited set of parameters (Location, Job type...). Each job has a description listing qualifications, requirements, application rules, as well as a button to apply to the position directly. WriterAccess is a matching service meant to connect writers, translators, content strategists, and translators with clients. Once you apply (they're currently mostly looking for professionals from the US, UK, Canada, Australia, and other countries where English is a native language). If you're accepted, you'll take a proficiency test, fill out your profile and have an AI match your skills and expertise with the right clients - you'll also be able to partake in writing contests and casting calls. Your earnings per word depend on your star rating, and you'll have t (pay 30%) worth in service fees to the website for all the work you're hired to do. Freedom with Writing is a writing market that offers a select number of writing opportunities sent directly to your email on a regular basis. The Freedom with Writing staff go through writing gigs currently available online, review them, and select the best ones - you'll find journalism work, essays and fiction contests, and lists of blogs who pay for guest posts on various subjects. Freelance Writing Gigs is similar to Freedom with Writing in a way that they both offer reviewed writing opportunities to its subscribers - the difference is that Freelance Writing Gigs offers a list of jobs every weekday. The jobs are categorized by job type, all have a location listed (or an indication that it's remote work), and most have hourly rates. Mediabistro offers a straightforward job searching experience - you select a desired job category (writing, editing, marketing, creative...), or enter your desired job title, and search. To apply to a position, you'll first need to upload your resume and portfolio, as well as provide your basic information. With Canadian Freelance Writing, you don't need to be Canadian to find work, and you get a service similar to that provided by Freelance Writing Gigs. - a regular string of blog posts compiling the freshest online writing jobs. You'll find unusual writing gigs such as fandom writing and quiz writing, but also the usual type of work, such as content, technical, legal, and UX writing. Contena offers a number of writing jobs you can directly apply to when you create an account - most of the work is paid on a monthly basis. Here, you'll find a number of interesting positions (categorized by type and ordered by the date it was posted on the website), such as Social Media Editor, Chatbot Content Writer, Celebrity news Writer, Travel Editor, and more. Kolabtree is a freelance platform where you can find scientific and academic work - there's a fair number of writing jobs you can look into, including research proposals, writing report results, technical blog posts, scientific eBooks, and similar projects. To apply to a position, you'll need to submit a proposal - each job has an approximate budget already listed, so you can start from there. If the client likes your proposal, you'll get an invite to a private discussion where you'll go over the additional details and deadlines - if this discussion goes well, you're likely to get the job. All Freelance Writing lets clients post jobs that stay up during the course of 30 days - you'll get to scroll available job positions and make your picks. This websites offers various types of writing work (political blogging, lifestyle writing, real estate blogging...), and you can view the client's budget for the project (with indication whether the total budget is very low). With Journalism Jobs, you'll get a listicle view of all currently available jobs in the field of journalism - you'll get to scroll the board manually, refine your search through parameters (industry, location, date posted, job type), or subscribe to daily job alerts. 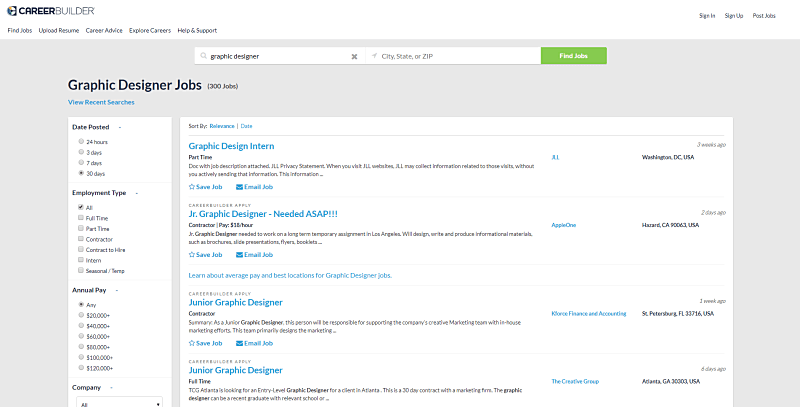 You'll be able to apply to jobs directly, but also share, save, or print jobs you like. PubLoft is a writing platform where you can apply to enter a network of freelance writers looking for client work. To apply, you'll need to fill out a form and pass some proficiency tests - once you'er accepted you'll gain access to a number of high-end projects (pay-per-post starts at $150). The website collects payments from its clients on a monthly basis, and you'll receive payments every other week. Paid to Blog promises quality work to the members of their freelance writing community - their team goes over the newest freelance writing gigs, reviews them, and selects only the quality ones. These quality jobs are then added to a job board where you can find what you're looking for by browsing the list (details for each job include client information, pay rate, word count...). The subscription fee is $30, but you'll save a lot of time you'd otherwise spent going over different job boards on your own. The Writing Opportunities Reddit page offers discussions on writing practices and trends, but also regular calls to submission linking to newest job opportunities in the writing industry. Wedding photos, artistic images, and savoring memories from the latest cruise around the Caribbean are all the rage nowadays - so, it's relatively easy to find work as a photographer, when you know where to look. Get Photography Jobs is a straightforward job board for photographers offering work in US states and cities - you'll find an extensive selection of job opportunities available, from Alabama to Wyoming. You'll also get a chance to subscribe to the websites' emailing list, and receive job updates on a regular basis. 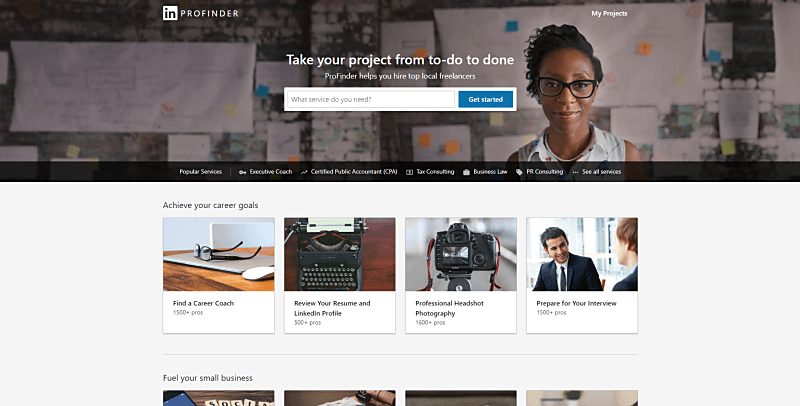 Photography Jobs Finder helps photographers connect with clients in two different ways - through a classic job board, or by submitting your email and receiving weekly job alerts to your email inbox. You can also submit your CV to the website (if you sign up for a free account), to have clients you've contacted view your skills and qualifications, before making a decision to accept (or reject) your offer. The Creative Loft is another extensive job board for US photographers, and you'll have more parameters to help you refine your search - you'll be able to select your desired US state, city, job type (freelance, part-time), occupation (photographer, assistant...), fields (studio, portrait, wedding...). The jobs are also reviewed for authenticity before being posted, so you'll increase your chances of landing quality work. You'll be able to browse the job board without creating an account, but you'll have to register for one in order to view full postings and access the websites search engine. You can even land a photographer job if you cruise (get it?) through a website offering cruise ship jobs. You'll need to register for an account to apply to photography jobs on this website, but if you get hired, the pay is substantial (~$1,800-$2,800 /mo). Also, you'll get an interesting work “scenery”, and you'll get to travel - the job profiles usually required are photo managers, photographers, videographers, and similar positions. Data entry may not be the most glamorous of jobs, but it's still a nice option for newbie freelancers who like tackling micro-tasks - and there are specific websites that provide just that type of work. Mturk is an Amazon-based crowdsource marketplace where you can offer your services, if you're versed in moderating content, performing research or dapa duplication. You'll have to sign up for an account in order to become eligible for job opportunities at Mturk - then, you'll get to work on microtasks, either through an integrated API or through a friendly interface. Clickworker is a straightforward platform where you can perform and be paid for a number of micro-tasks, including survey participation, correcting texts, categorizing data, research tasks, and similar. Clickworker offers a classic freelance approach, so you'll have a flexible schedule, and work independently. To apply, you'll need to create a user profile, complete some short assessments, and then you'll have appropriate micro-tasks sent directly to you. As the number of jobs that can be performed remotely increases, so does the need for virtual assistants - here's where you can apply or look for work if you're interested to handle someone's administrative work from the comfort of your home. Assistant Match provides job opportunities to virtual assistants - once you register for an account you'll be in a position to get matched with clients who are looking for your type of skills and expertise, or receive job opportunities via email. The website also provides VA training and resources, so if worth checking out if you're interested to expand on your virtual assistant career. Time Etc essentially offers work to personal, executive, and admin assistants, as well as secretaries. If you pass the application process, you'll work at least three hours between Monday and Friday from home. To apply, you'll need to have some commercial experience (2-3 years), so this website isn't the best option for newbies, but it is a great side business for those somewhat versed in providing virtual assistance. Worldwide 101 is a matching service and virtual assistant platform for where you'll be able to find a steady stream of work - though you'll have to pass the screening process first. This platform is more exclusive, but you'll gain access to some high-end clients and quality work. Fancy Hands is a typical job platform where you'll be able to find freelance virtual tasks which include making phone calls, conducting online research, and performing data entry, though there is a curated number of managerial positions available as well. All work is parsed by tasks, and each task holds a certain amount you can earn. Search volume: 20/mo • Number of available positions: ? Belay is a job platform for where you can find remote, part-time positions for virtual assistants, web specialists, and bookkeepers. You'll get to determine your own work hours (though the minimum per week is 10 hours) - you'll just need to pass an email and video interview. This website is perfect if you're looking to build a career in virtual assistance, as you'll be provided with full-time work, but perhaps not suitable for newbies, as the training resources are limited. If you're US-based and looking for full-time opportunities, then Zirtual is worth checking out - you'll get a chance to provide virtual assistance to entrepreneurs, small businesses, and other similar professionals. Tasks include inbox management, expensing & Invoicing, data entry, property management, booking flights, various personal tasks, and more. Zirtual is limited in the number of virtual positions available, but it's worth checking them out periodically - they even offer employee benefits to their freelancers. HelloRache is a US-based company offering virtual assistant jobs in the healthcare industry. Medical professionals with the right degree and certification can apply to carry out work such as communicating and interacting with patients, gathering medical insurance information, updating patient's chart records, handling various administrative tasks, and more. VA Networking is a networking community for virtual assistants where Va's just starting out can find great advice and resources, but also a job board with the latest VA opportunities. It's free to sign up, and you gain access to a community forum, informative videos, ebooks, checklists, and similar useful resources. If you're looking to pass on your knowledge of Math, Science, Physics, or Foreign Languages to students, here's where to look. Tutor.com • TutorEye • Udemy • Skooli • TutorVista • Tutor Pace Inc.
Tutor.com offers part-time tutoring job in 8 subject sections (Math, Social Studies, Foreign Language, AP Support, Science...), and over 40 subjects (Geometry, Science, Essay Writing, World History...). To enter this tutoring community, you'll need to take an exam in the subject you want to teach, hold a mock lesson, have your background checked, and if you're satisfactory on all levels, you can start tutoring. TutorEye is another tutoring platform where you can teach Physics, Chemistry, Science, Algebra, Literature, Precalculus, and Biology, among other subjects, and all online. If you pass the application process, you'll get to conduct one-to-one teaching sessions in an interactive online classroom. Udemy is an online learning/teaching platform where you can advertise your teaching courses in the field of development, design, IT & Software, Personal Development, Marketing, and much more, in over 50 languages. To become an instructor, you'll need to plan your course, and record a video showing a preview of what you'll teach - if you're unsure of how to structure your classes, there's even a free Udemy course on how to structure a course. Skooli offers a tutoring platform for both online and in-person tutoring in elementary, middle school, high, highschool, and college subjects. To start teaching at Skooli, you'll need to have at least a Bachelor's degree (Though a Master's degree or PhD is favorable), as well as a teaching certification, provincial or state teaching license, and necessary language certifications (if you're teaching a language). To successfully apply, you'll need to be a postgraduate in the subject you want to teach, and be obliged to work for 4 hours per day - in return, you'll get to work on a flexible schedule and work with new teaching tools and technologies. Tutor Pace INC. offers online tutoring jobs on a smaller scale, in very specific subjects, such as accounting, computer science, economics, but also Math, Science, and various exam preparation classes. You'll need an excellent command of the English language to apply, and the ability to teach the selected subject at a college grade level. If you have an excellent command of two or more languages, check out these websites looking for translators, interpreters, and other language specialists - bonus points if you know an rare language. Unbabel is a translation platform for reviewing and improving translations - the initial translations are carried out through AI, and you're the human link making sure the text sounds natural and contextually accurate. To tackle available translation tasks, you'll first need to check whether the languages you're proficient in are available - only one language professional is required per language pair, so the competition is stiff. If you've found your match, you'll need to take a proficiency test - once you've passed this, you'll gain access to a translation platform with all tasks suitable for your language par, complete with guidelines and other information. TranslatorsCafe is a translator community which offers a comprehensive job board with a bidding system - for each translator, proofreading, or interpreter job, you'll see its language pair and time when it was posted. When you enter the job's description, you'll see how many times the job was viewed, and more importantly, how many people bid on it so far, before making your own offer. Considering this is a translator community, you'll also have access to various useful resources, such as glossaries. TRADUguide offers another straightforward job board with a bidding system - you can browse through the available jobs by date posted, or language pair. Each job has its number of already made offers listed, and you'll also be able to view what projects are currently closed for bidding. Once you see something that fits your skills, you can send your quote directly from the website. Proz.com offers an extensive job-board with the latest offerings in translation jobs (languages pairs include Spanish to French, English to Norwegian, German to French, etc.) - a lot of clients request freelancers especially. You can view projects specs (word count, document type, requirements, time left to submit quote, the number of people who already submitted quotes), before submitting your own estimation. You'll also be able to view the client's rating showing how likely they are to provide repeat work. Globtra is a translation community where you can connect with clients and take on various translation projects - you'll just need to open a free account, select your language pair(s), and define your skills first. Within this website you can run a translation business on a small scale - search the available job offers and respond to project invitations from clients. You'll get to choose your own payment method (PayPal, credit cards, wire transfers), and have your invoices and payments processed through Gobtra. TranslatorBase is a straightforward job board with various language pairs (English - Arabic, Bulgarian - German, Spanich - Estonian, etc) and translation jobs you can choose from (translating CV documents, learning modules, books, video and audio transcripts, etc). You can browse through jobs manually, or search by specific Source and Target language, and type of project. Gengo is an exclusive translation platform where it's difficult to get in, but you'll get to enjoy a number of great benefits if you do. You'll be able to choose your own projects and clients, partake in the website's forum, as well as make use of innovative translator technology and other resources. Remote work with clients all over the world is rewarding, but sometimes you're just looking for something local - and here's where you should look. TaskRabbit is a US location-based marketplace where you can apply to become a “Tasker” and gain access to a number of different (mostly physical) jobs in your neighbourhood. You'll be able to create a profile, define your skills and price, in order to attract clients - available work includes furniture assembly, heavy lifting, and home improvement, among other work. You can get a ride with Uber, but did you know you can easily apply to become an Uber driver? You'll be able to set your own schedule, take on rides when it's convenient for you, and get paid on a weekly basis. You will, however, have to meet certain requirements, like being at least 21 years old, having at least a one-year old licence (or three, if you're 23), and having access to a 4-door vehicle 10 years old or newer, among other requirements. Localsolo is a location-based freelance job platform, where you can occasionally find freelance work near you (though remote work is occasionally an option). From time to time, you'll be able to find anything from software engineering to wedding photo editors - so keep this website also in mind for your freelance work. 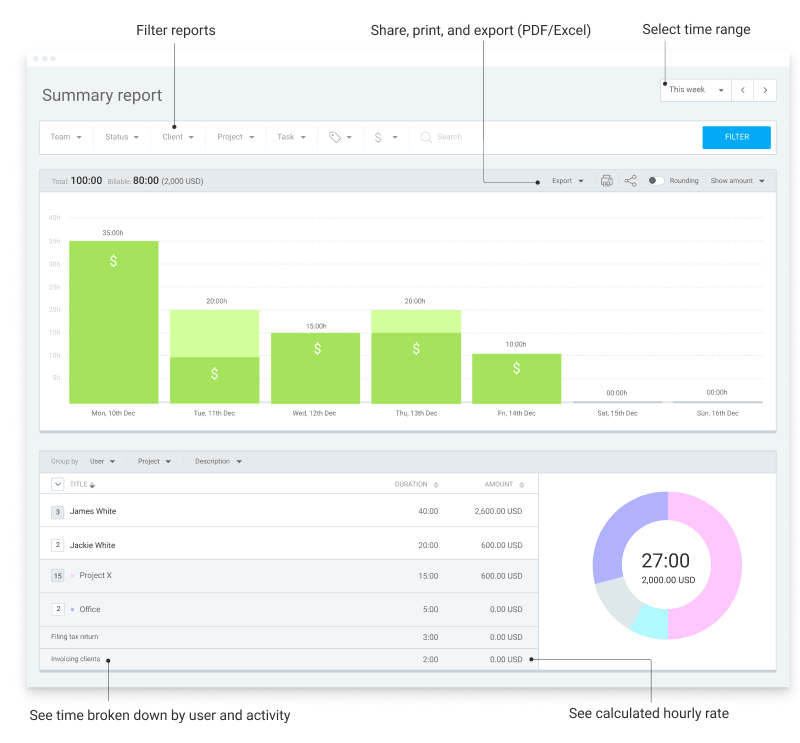 Need a good time tracker that calculates your billable hours automatically? Clockify lets you track how much time you spend working on projects and automatically calculates your earnings based on your hourly rates.